Expert consensus holds that the national financial meltdown of 2008 was due in no small measure to the failure to adequately regulate derivatives, arcane and complex financial instruments that few outside of high finance really understood. Congress’s response to the crisis of three years ago, the legislation known as the Dodd-Frank Act, included provisions to regulate the derivatives market much more closely in an attempt to prevent a repeat of the conditions that led to today’s anemic economy. How is it working? Eric Juzenas, senior counsel to Chairman Gary Gensler, Commodity Futures Trading Commission, spoke on Oct. 19 at the invitation of Catholic University’s Securities Law Program about where things stand at the moment. 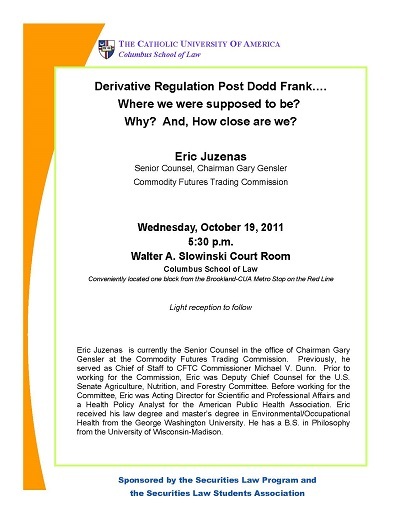 Juzenas, Eric, "Derivative Regulation Post Dodd Frank...." (2011). Securities Law Program Lecture Series. 16.